SRP Professional Pistons include features used in professional racing such as lightweight forged side relief (FSR) forgings, high quality wrist pins, and precision CNC machined ring grooves and skirts. In addition, every package includes JE Pro Seal Premium Piston Rings. The included ring set features a 1.2 premium steel top ring, 1.5mm Napier (hooked face) second ring and 3.0mm standard tension oil ring. Every piston is designed and manufactured in the USA at the advanced JE/SRP Pistons manufacturing center. SRP Professional piston designs were created using 3D computer modeling and tested for strength using Finite Element Analysis (FEA). Several revisions were made to optimize the strength and weight before manufacturing began. 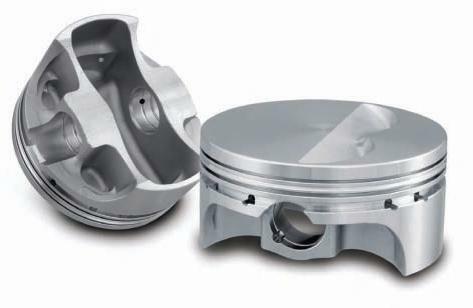 Unlike other piston manufacturers, JE/SRP Pistons manufacture billet pistons from solid pucks of aluminum for dyno testing in actual engines prior to approving the final forging designs. SRP Professional Pistons are sold INDIVIDUALLY for replacement or test fitting purposes.